When allowed to adapt naturally to the changing winter temperatures, chickens do just fine on their own. 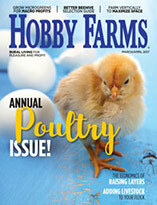 We all worry about our chickens on the coldest days of winter, but those days aren’t here yet. In the last week or so, I’ve read some disturbing things from novice chicken keepers about how they’re dealing with cold fall weather, and they’re fretting over how much more they’ll have to do in January. I’ve seen people blasting chickens with the heat lamps they used in brooders, simultaneously heating the birds and disrupting the flocks’ sleep cycles. Another has thoroughly wrapped a chicken run with plastic on all sides. My friends, I am giving you permission to stop over-parenting your flock! 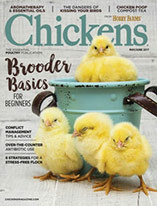 Repeat this factual mantra that will see you through to spring: Chickens are birds. Certainly, there are times when the cold can be dangerous, but most of the time, the cold poses no danger at all. Chickens aren’t mammals, and they have an incredible ability to adapt to changing weather conditions as they occur slowly over time. Heating a chicken coop will create an ambient environment that is impossible to maintain during an emergency, like in an ice storm that causes a power outage. A sudden drop in temperature to a flock of chickens that hasn’t adapted to the cold can kill them quickly. The only way to prepare for the possibility of a winter-weather emergency is to allow your flock to adapt to the seasons as they naturally would, which also saves you a lot of work. Various breeds molt between summer and late fall, preparing to keep their bodies warm through the winter with fresh, insulating feathers. A chicken’s average body temperature runs about 105 degrees F, and your flock will huddle together to keep everyone warm. They’re very good at staying warm, because they’re birds and they’re intended to live outdoors. Have you ever seen a chicken fluff up her feathers and hold them in place? She’s creating pockets of air between the feathers that traps her body heat, surrounding her in a bubble of warmth. Mmm, the thought makes me want to curl up with a book. 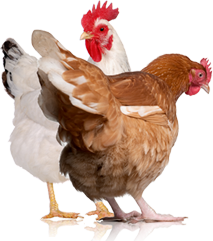 The most important thing you can do to keep your chickens warm is to never let them run out of feed. Digestion creates body heat, and food provides energy that will help them stay toasty. Plus, there’s not much foraging to be had in the winter months—you’ll go through feed faster in the winter. A warm breakfast on an especially chilly morning is always a kind gesture, too. To prepare for the coldest months, consider from which direction the coldest weather blows in. For me, it’s from the north and sometimes the west. Because my coop is mobile, I will turn the long side toward the wind to break it. This keeps wind from blowing through the coop and taking heat away from the birds. Another option is to cover just the north side, or the north and west sides with either a tarp or a sheet of plastic. And, keeping the coop full of clean, dry bedding will insulate the coop when they need it most. When we’re talking about severe temperatures—those that dip below zero with wind chills in the negative double digits—we do need to take extra care. On one occasion, I put a 2-liter bottle of hot water in the coop. Usually I just throw in extra bedding, and cover the north side with a tarp. Even my delicate, scrappy Polish has survived five winters without supplemental heat. The chickens will heat the coop themselves, and they will be fine. Too much intervention, or believing that their coop temperature needs to feel comfortable to you, can put them in danger. Unless you live very far north, like in Alaska, Minnesota or North Dakota, you won’t need to heat your coop at all. If you do live in the north, be sure to raise only heavy, cold-hardy breeds that can adapt and tolerate very cold temperatures. 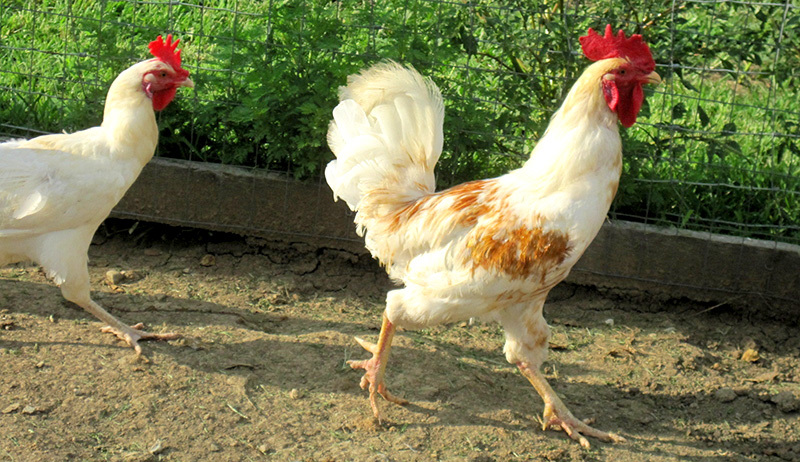 For the most part, your only job is to support your chickens’ ability to care for themselves. Don’t overdo it; let go of the handles and let them be chickens.